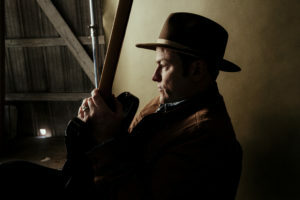 Adam Hood performs live at the Listening Room on Sept. 26. Whether it’s behind the scenes writing or onstage performing, singer-songwriter Adam Hood is making his mark in the music industry. You may recognize some of his work performed by Miranda Lambert, Little Big Town, Lee Ann Womack and Anderson East, just to name a few. Hood, originally from Opelika, Alabama, started his music career at a young age when his parents first bought him a guitar. He played in his church at age 14, and when he was 16, his mother got him a gig at a local chicken finger restaurant where he played on Friday and Saturday nights. As his career progressed, Hood toured with Miranda Lambert, Pat Green and Leon Russell. In 2016, he signed a publishing deal with Warner/Chappell Nashville and Grammy award-winning producer Dave Cobb’s Low Country Sound. Hood says his songwriting inspiration comes from everyday life and conversations and describes his writing process as organic. Even though he relishes writing alone, he also appreciates the fellowship of collaborating with others. Most recently, he co-wrote “Front Porch Thing” for Little Big Town with singer-songwriter Chris Stapleton. Hood’s new album, “Somewhere in Between,” debuts Oct. 12. He teamed up with friend and producer Oran Thornton and recorded most of the album live at Nashville’s Sound Emporium Studios in only two days. Guitarist Pat McLaughlin, bassist Lex Price and drummer Jerry Roe also joined him in the studio. Outside of being an artist, Hood is a husband and father, a self-professed family man who prefers to be home as much as possible. He currently resides in Northport, Alabama, but is in Nashville twice a month and always tries to make it home before dinner to be home with his wife and children. It’s been six years since Hood last performed in Mobile, and he is looking forward to a great show for his return. Hood is currently on tour and is performing at the Listening Room, 78 St Francis St., on Wednesday, Sept. 26 at 9 p.m. Tickets are $25. Call 251-367-4599 to reserve.